Specialists in the economics, regulation & policy of esports. THE ESPORTS MARKETS' AUDIENCE IS RAPIDLY APPROACHING THE MAGNITUDE OF THE WORLD’S MOST HIGHLY-VIEWED MEDIA EVENTS. WITH THIS POTENTIAL TO ATTRACT A DIVERSE DEMOGRAPHIC IT IS UNDENIABLE THAT ESPORTS WILL PLAY A CRITICAL ROLE IN THE FUTURE OF ENTERTAINMENT AND NEEDS TO BE ON THE AGENDA FOR POLICYMAKERS, OPERATORS, AND OTHER FORWARD-THINKING INDIVIDUALS. SPECTRUM ESPORTS ADVISORS ARE PLEASED TO PROVIDE AN UNPARALLELED SUITE OF SERVICES FOR THESE GROUPS. Each project is customized to our client’s specific requirements and developed from the ground up. Our findings, conclusions and recommendations are based solely on our research, analysis and experience. Our reports are used by our clients to shape public policy, secure financing, formulate marketing plans, determine scope and size of development, establish gaming regulations, and make licensing decisions, among other purposes. We tell clients what they need to know and we will not accept, and have never accepted, engagements that seek a preferred result. Millennial Esports provides a broad spectrum of turnkey solutions that covers gaming technology, event management, production, and broadcasting in an effort to give game publishers, consumer brands, and partners exposure and a path to access the most sought after demographics. By intentionally developing platofrms and programs with an eye towards creating complete service offerings for our clients, we can confidently wield a wealth of experience to ensure success for any custom solution or installation. Project gross gaming revenue and non-gaming revenue. Project property visitation and spend per patron/visit. Size the market and define the catchment area. Develop forward-looking, five-year profit-and-loss statements. Determine the optimal number of gaming positions. Develop a SWOT analysis for any project or market. Determine the reasonableness of existing internal or external projections. Assess qualitative factors such as transportation issues and barriers to entry. Strategic Planning - Spectrum Esports assists organizations in developing a cohesive, achievable plan designed to position themselves for growth in the foreseeable future. We recognize that a critical part of any strategic plan is the ability to adapt to change – be it a competitive threat, emerging forms of gaming, new laws/regulations, or changing economic/financial circumstances. We work with you to establish realistic goals and objectives, whether for a startup organization or a well-established company. Millennials inhouse analytics platform "Stream Hatchet" allows us to capture robust data points regarding event broadcasts and its viewers. Channel Analytics - Search live streaming channels. Track the activity of publishers and games for a deep understanding of trends. Check the audience reach in the live streaming platforms, campaigns, tournaments, sponsorship audience made easy. Identify key influencers in all the live streaming platforms and target audience with the right influencer. Evaluate the impact of any eSports organization. Track audience engagement - Average time watched, Chat analytics, Unique viewers. Spectrum Esports answers the critical questions that gaming operators, visitor/tourism agencies, and developers need to ask: Who are your customers, and what do they want? We undertake customized surveys (intercept, online, telephone), conduct focus groups, dive deep into databases, interview patrons and observe behaviour. We layer our primary research on top of secondary research where appropriate. The result: you know your customer, allowing you to design marketing programs, facilities and events to drive revenues. For jurisdictions that already embrace egaming, we analyze before-and-after data; for jurisdictions that may become an egaming host, we analyze the experiences in comparable jurisdictions. We get on the ground to interview a wide swath of those who have been or would be impacted by gaming from the small-business owner to the executive director of the problem-gambling support group to the local police chief. The Millennial Esports tournament operations team is composed of individuals that have both the right business acumen and gaming experience to deliver and excel in any competition or tournament scenario. The team has been facilitating both online and live event tournaments for the past decade across a plethora of titles utilizing experience, knowledge and practices derived from multiple different tournament operators in the industry. Millennial Esports has years of experience facilitating large scale live tournament events at gaming conventions around the country as well as in our Las Vegas based thE Arena, the first purpose built esports arena to open in North America. The Arena has been home to the Halo World Championship, Madden Challenger, and Amazon Mobile Masters events among many others. Whether for the benefit of legislators or directly for a government entity, our team brings its wealth of esports-related experience to bear in advising both companies and governments on esports-related public policy. Private & Public Companies - With the growing global emergence of the Esports marketspace, industry leaders call on our expertise to ensure they are in full compliance. Our senior team of operators, regulators, AML specialists, law-enforcement professionals, attorneys and accountants provides a detailed examination of, and then recommendations for, Esports related regulations. Multi-Level Governments - State and national governments seeking to legalize or expand esports recognize that it is critically important to do it right the first time. Therefore, they can on our team of attorneys, regulators, policy analysts and specialists for services that include drafting and amending legislation, developing regulations, structuring gaming commissions, writing RFPs and providing ongoing consultation. We immerse ourselves in the process, working hand in hand with legislators, regulators and staff to ensure that the outcome is comprehensive, compliant and beneficial to both government and industry. Our partnership provides a broad spectrum of turnkey solutions that covers gaming technology, event management, production, and broadcasting in an effort to give game publishers, consumer brands, and partners exposure and a path to access the most sought-after demographics. Our web and app platforms allow Millennial to run all manner of tournament programs from those with global reach to live events smoothly and seamlessly. Alex Igelman, the Founder of Millennial Esports Corp., is a lawyer with over 25 years of experience in technology, entertainment and casino gaming. Under his leadership, Millennial Esports Corp. expanded and became a vertically integrated mobile gaming publisher which today leads a revolution to fuse Esports racing and professional motorsport through a global competition model. Millennial Esports Corp. utilizes its gaming franchises and intellectual property (IP) to engage millions of new players in the industry. Combined with its virtual and live tournament platforms, gaming analytics capability, and motorsport IP, Millennial Esports Corp. is uniquely positioned to become the market leader in Esports Racing. 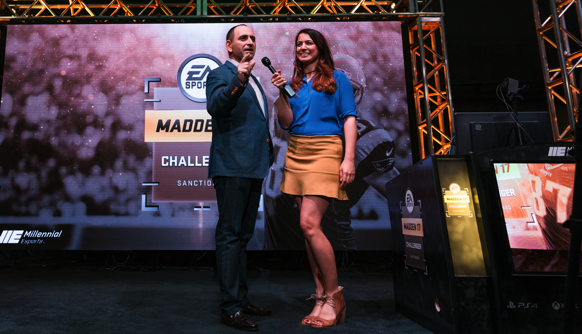 In his capacity as Executive Chairman, Igelman continues to drive strategy, vision and direction at Millennial Esports Corp. Spectrum is a consultancy group that specializes in the economics, regulation and policy of legalized gambling worldwide. Spectrum has provided independent research and professional services to public and private sector clients since its founding year in 1993. Principals at Spectrum have strong backgrounds in gaming operations, financial and economic analysis, law enforcement, due diligence, gaming regulation, and compliance and journalism. Spectrum employs only renowned experts in every facet of the gaming industry. Spectrum is widely recognized by gaming regulators, government agencies, gaming operators and analysts throughout the world for delivering independent, transparent and credible research and analysis that withstands the highest levels of scrutiny and helps respective clients to reach targeted goals. As esports becomes a truly global phenomenon, there exists a need for a specialized group of multidiscipline experts to provide guidance, advisory, and oversight services. Policymakers, operators, and forward-thinkers who possess a vision in esports will now have the option to engage in a partnership with Spectrum Esports Advisors for expertise and services. Pollock began analyzing the casino industry in 1978 and served as spokesman for the New Jersey Casino Control Commission from 1991 through 1996. He was a close advisor to the chairman and oversaw the Office of Legislative Liaison. During this period of rapid deregulation, his charge was to maintain public confidence in the integrity of the regulatory system. He has led Spectrum economic analyses in markets throughout North America, as well as in Latin America, Europe and Asia. Alex Igelman, founder of Millennial Esports Corp, is a lawyer with over 28 years of experience in technology, entertainment and gaming. In 1996, Igelman was the first lawyer to focus on Internet gaming and in this regard was instrumental in the early success of both PartyGaming and PokerStars. In 2004, he was involved in the creation and formation of GVC, an AIM listed public gaming company that has since become a giant in the space. Since 2014, Igelman has been focused on esports. He began a strategic advisory role to Pro Gaming League (PGL), an early esports company that was later acquired by Millennial Esports Corp. In 2016, through a reverse merger, Millennial Esports, the company Igelman founded, debuted on the TSX-V under the symbol GAME – with Igelman taking the helm as CEO. In August 2018, Igelman transitioned from his role as CEO to executive chairman. During his overall tenure at Millennial, Igelman raised in excess of $25,000,000.00 and acquired three companies including mobile developer Eden Games and streaming analytics company, Streamhatchet. In 2019, Igelman founded Esports Capital Corp. (ECC), a new undertaking that he will lead as managing director. ECC is a company focused on facilitating and curating relevant opportunities in esports and gaming through its network of experts and advisors. Josh Faber is currently assisting in the launch of Spectrum’s esports consultancy with some of the premier gaming groups in the world. Faber was most recently Vice President at the Roth Group, a government affairs firm representing Fortune 500 companies, mayors, colleges, CEOs and major Washington, DC trade associations. He directed day-to-day legislative affairs of lobbying and consulting firm owned by former nine-term member of Congress. Faber advised governors, mayors, CEOs, senior academic leaders and Fortune 500 companies on congressional and administration funding issues. His clients have included: Mayor of Ponce, Puerto Rico; Mayor of Caguas, Puerto Rico; three Governors of Puerto Rico, Johnson Controls, AT&T, Nestle USA, PhRMA, American Public Power Association, St. Norbert College, NAPCO Security, Magna Entertainment, The Stronach Group, Stockbridge Munsee, Villalba, Puerto Rico; and Yauco, Puerto Rico, among others. He was previously part of the National Republican Senatorial Committee for Chairman Senator Mitch McConnell. Prior to his work with Majority Leader McConnell he worked on Senator Dole's 1996 Presidential campaign. David Isaacson is Vice President of Spectrum Gaming Capital. Isaacson has been analyzing the gaming industry since 2010. At SGC he works on a broad range of projects, including strategic advisory engagements, market analyses, litigation support, valuation and digital gaming, among other areas. He joined Spectrum Gaming Capital from Moody’s Investors Service, the top rating agency, where he covered a portfolio of high yield gaming, lodging and cruise companies. In his work at Moody’s, Isaacson was responsible for assigning rating recommendations, monitoring ratings and drafting credit related research on a portfolio of gaming and leisure companies and the industry as a whole. He is particularly skilled at analyzing gaming bank loans, high yield and other forms of corporate debt. Prior to covering the gaming and leisure industry, Isaacson worked for Moody’s Analytics as a Structured Finance Analyst. Isaacson has an MBA from NYU’s Stern School of Business with a concentration in Corporate Finance and Accounting and a Bachelor's from Yeshiva University, where he majored in Economics and graduated with honors. Steven M. Ingis is an attorney with 33 years of experience in casino gaming regulation. During his tenure with Spectrum, Ingis has been the supervising attorney for investigative services on behalf of casino regulatory agencies in Ohio, Massachusetts, Maryland, Maine, Jamaica, Virgin Islands and Puerto Rico. He has testified before legislative bodies in Pennsylvania and New Hampshire regarding casino gaming regulatory issues. Ingis also assisted in the drafting of table games legislation in Delaware and the promulgation of regulations for the Ohio Casino Control Commission. In addition, he recently assisted in drafting the enabling legislation implementing casino gaming in Bermuda and proposed regulations for Massachusetts’ fledgling casino gaming industry. Prior to joining Spectrum, he was employed by the New Jersey Casino Control Commission from 1982 until retiring in September 2008. As Assistant General Counsel for the Commission, Ingis managed the Licensing Unit in the Office of the General Counsel, and was responsible for all casino employee and entity licensing matters. Ingis advised the Commission in many of its most notable licensing matters and represented the Commission in numerous court cases, including the 2007 denial of Tropicana Casino Hotel’s license renewal application. In this regard, he successfully argued the appeal from the Commission’s decision in the New Jersey Appellate Division. Prior to joining the Casino Control Commission, Ingis served as an Assistant Morris County (NJ) Prosecutor and a Deputy Attorney General in the New Jersey Division of Criminal Justice, in addition to being employed in private practice. An engineer and executive, throughout the past 10 years, Adam Morrison has served as CTO and COO for various technology based companies whose focuses have ranged from gaming to entertainment to event execution. A life long avid gamer and enthusiast, Adam currently serves as CTO for Millennial Esports Corp. TSX-V: GAME and is also a founding member of its predecessor, Pro Gaming League. In the recent past, Mr. Morrison has played pivotal roles in many of Millennial’s larger undertakings, some of which include the design and build out of the Millennial Studio and Arena in downtown Las Vegas, the design and production of each of Millennials digital software assets, and also filling the role of executive producer for several of the larger events and competitions that the organization has hosted in the past. Aside from his work with Millennial, Mr. Morrison is also a co-founder and former CEO for the pro Esports franchise, Team Reciprocity. Mr. Morrison holds an honors degree in Systems and Computer Engineering.